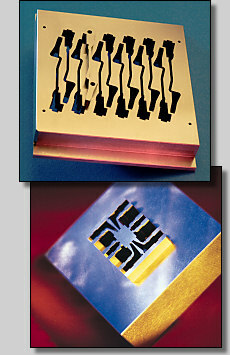 EDM Services, founded in 1978, quickly established a solid reputation as a supplier of high-quality tooling components. These components are used in high-speed progressive stamping dies and extrusion dies with intricate or odd shapes that can't be made without the use of traveling wire EDM machines. Over the years, EDM Services realized that to stay ahead of other wire EDM shops being formed, it was necessary to have the latest and most efficient equipment available and more importantly the training, skill, and dedication of its employees. Each of our shop employees has completed an apprenticeship (or is now serving as an apprentice) with either a tool and die maker, a precision carbide tool grinder, or a wire EDM machinist. Each of these training programs is certified by the Commonwealth of Pennsylvania Department of Labor and Industry. The President of EDM Services and each department manager has also completed the training and is a Journeyman tool and die maker. Along with wire EDM, we offer the facilities and skilled workers to supply precision grinding of steel, carbide or ceramic components that must be supplied to close tolerances. If your requirement is for complete tools, EDM Services can supply one to your exact specifications or design and build a tool in-house.